Hello everyone...I hope this 3rd day of the new year finds you filled with hope and promise for a glorious new year! Now it's time to don your sumptious silver and get the party started. 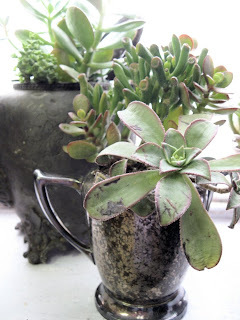 I thought since the new year signifies renewal and growth that I would share my collection of vintage discarded and tarnished silver, repurposed into a garden of luscious succulents. I feel like a pirate when I find a bounty of old silver at the flea market...I pile it up, stack it in my cart and clink and clank all the way home....arrrgh matey! We also, won't mention the fact that I have a very black thumb. 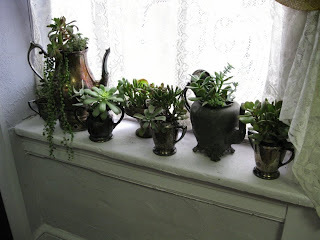 Wlell, since I did mention it, I'll let you know in case you suffer from a similar affliction, that succulents rock! 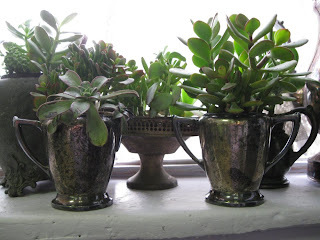 Easy to take care of and barely need to be watered.....just a bit of sunshine, dirt and tarnished silver and voila! silver succulent garden! Can't wait to see everyones' silver treasures! Thank you all for participating in Silver Sunday! and for checking out my stash..be sure to check in with all the Silver Sunday Sistas on the list and lets start the new year off with a bang bling! That's what I adore...a woman pirate who knows something fabulous like a succulent garden to start this bloggin party off with a big bling...AWESOME! I love it tarnished...still have customers who talk about cleaning all of it up pretty...I cringe a little because alot of its beauty is in the tarnish so many times. I'm so glad your hosting this party, turns out I knew very little about silver. I love learning about new things. Thank you! This collection is absolutely wicked! What a fabulous way to display your silver bounty!! I'll be posting tomorrow! I'm looking forward to seeing everyones loot!! Oh what a great collection and I also love succulents! It makes me look at old tarnished silver in a whole new light!!! I just finished writing and posting my first Silver Sunday. I just love the idea and I hope you continue to host it. I love your tarnished silver garden, it has a certain mysterious look yet, it's quite elegant. I am really looking forward to visiting everyone else's post, so I'll be back later. Oh I LOVE tarnished silver!! I also love your succulent garden and I see myself "stealing" that idea for some of my pieces. Thanks for hosting the party. I'll be getting my post ready tonight. Looking forward to seeing everyone's great silver finds. 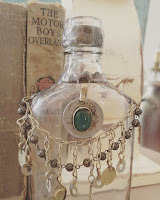 This is just perfect, I love the colour of the cactus against the tarnished silver.... beautiful! My Silver Sunday post goes up at midnight! Thanks for being such a lovely hostess. Beth, what a fantastic way to show off your silver! I think I'll be planning a trip to the garden center tomorrow! I love it. Your pictures are just gorgeous! Thank you so much for sharing and for hosting 'Silver Sunday' . . . I'm appreciating my silver all over again! Beth, It's such a great idea to use those silver pots and jugs for plants! That way you have a wonderful garden with bling inside your home! It's a good thing I couldn't sleep and was up really early...I almost forgot all about Silver Sunday! I amended my post last night...so whew...I'm in! Promise to be ready and all set on time next weekend!!! thank you! looking forward to more silver!! Glad I found you. I also have a 'thing' about silver and am forced to sell it to justify my buying it all! What a wonderful idea... I admit to be a "silver polisher"... with zest... but there are always those items that are too far gone... now I have a wonderful new idea to use them with... thanks! Love Silver Sunday... I've been out of the loop lately and didin't realize what I was going to miss! What a great party! I just found you...drats! I know it's too late for your first party, but I'll be back next week! LOVE your "garden". It's so pretty! I love all your silver pieces, what a great way to display them!. AND I love your "Somewhere Over the Rainbow" playing. It's light and funky, very uplifting! Enjoy your Sunday, I'll be back! I like the idea of Silver Sunday & so I am participating! 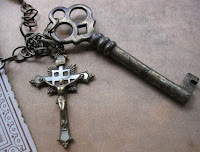 Please stop by my blog to see my little collection of antique & vintage silver goodies. Good Sunday to all! I am visiting from BJ's blog and just love your silver and succulents!! Thanks for hosting Silver Sunday! The plants look fantastic in all that wonderful tarnished silver! I was a little late getting French Cupboard signed up - sorry about that. But it's all ready to go now. Thank you for hosting this for us. It's going to be so much fun! Thank you for hosting this super fun party! I posted a bit late...creeped up! 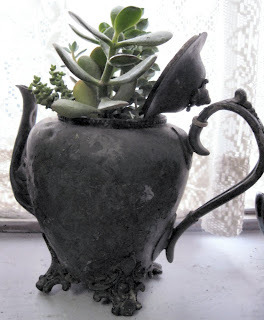 Fabulous idea with the succulents....your teapots are fantastic...I think I will be on the lookout this year...great idea!! Happy Silver Sunday...can't wait for next week! Sorry I was a little late getting my post written but I wanted to let you know that my first Silver Sunday post is up! Thanks again for hosting. I just found your blog and LOVE it! Silver Sunday is a great idea. here is a bit of my silver! I too, love succulents because they seem impervious to neglect. They look spectacular in your mismatched silver containers. Very clever and pretty! What a fabulous idea! I just love your little garden. I have taken to collecting silver and silverplate lately and the best thing is, it's always inexpensive. It appears that no one in the neck of the woods wants it. It must be the thought of polishing. No need to let anyone know that silver looks awesome when left in it's natural, tarnished state. 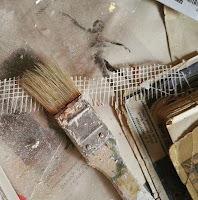 I arrive in a very Kramer'esque fashion (peeling into the room at the last minute) but I did manage to put up a quick post. Thanks for hosting! Love this party! Thanks for hosting it! I know I'm a bit late, but I'm joining in today, also! I love your tarnished silver. It looks lovely in your window used as planters! Oh, what a great idea, Beth! I am also a lover of old silver and I am so happy that it's sooo easy to find at GW right now! I love the idea of your party! Please add me to the list of participants! I'm so glad I came across your blog and would like to join in on your "Silver Sunday" theme. I've really been drawn to it lately and there is so much potential in these lovely old pieces. I will post later this evening. Thanks and Best wishes to you in 2010. Why am I just now finding/following your blog? Love all your silver, I adore silver, especially mercury glass...what a fun party... I came over from Fiona and Twig. Now I need to visit all the others! I was so glad to see your tarnished silver. I always thought I was weird cuz I never liked to polish it either. It looks so cool and mysterious unpolished. Neat blog! I'm late, I'm late for this very important date! I just now read about Silver Sunday at Fiona & Twigs. I guess it's too late to play today, but can I join in the fun for next Sunday? I adore silver and would love to share. The tarnished silver succulent garden is a winner. So happy to find your blog. I've just added myself as a follower. I'll add your Silver Sunday button to my blog. Hope you come visit sometime. What a fun way to reuse your silver. The silver goods great with that fresh succulent green! The party will be a challenge for me because I will have to expand my silver uses! My first visit, great blog. I love old silver, but I have never shown mine that much because I hate cleaning it. I will try to post next week. Stop by sometime. You will find lots of yard sale finds, thirft store and the best of the best free stuff at Copper~N~Things. Thanks for sharing your creativity. Thanks for letting me join in. I love the succulents in the silver....and then all clustered together. Beautiful vignette! Love your pictures...please add me to the party (if it's not too late!)!! love your blog....so happy to have found it....hope it's not too late to join your party....i have done recent work on my own mercury glass creations that you can see at my blog.....sweetwaterbend.blogspot.com. Your silver is just gorgous! I'm going to join in next week! Love silver! 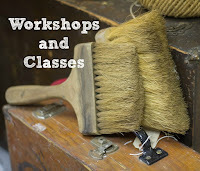 Found your blog through Marty's A Stroll Thru Life and am glad I did! Though I have limited actual silver pieces, I always thought of them as a "pain" due to the polishing they require. I have a new appreciation for them seeing what you have done and love that your succulent garden uses TARNISHED silver pieces! Adds to the charm! Thank you for hosting this fabulous party! I'm late - but I'll do better next week! My post is a little off-beat, as I forgot until I saw Fiona and Twig's post! EEK! just today (a day late) i posted about a silver scuttle. great minds think alike!!! making planters is a great way to use silver. Is there still time to join? I'd love to participate! Gosh and gol darn it ... I take a break and miss the party!! Just heard about your Silver Sundays and need to visit all the sistas tomorrow! Would love to join in next week if ya'll would have me! 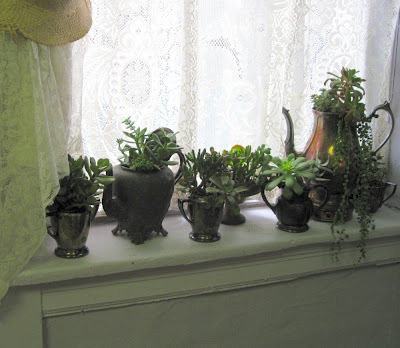 ps ... even better than succulents are the faux succulents from Pottery Barn, hee hee ... they work great where you can't reach! You may have more interest in Silver Sunday. 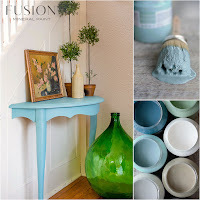 I posted a link on my inspiration post yesterday! Hope you don't mind!! What a fabulous idea! Very cute indeed! I am up! Thanks for hosting!